It is not often that a remarkable gem of a manuscript is uncovered and published. Geoffrey Wellum’s First Light was one example. The memoir of Timothy Ashmead Vigors is another. Born in Hatfield but raised in Eire and educated at Eton and Cranwell, early 1940 found Tim Vigors in France flying Fairey Battle bombers. After the Fall he converted to fighters joining 222 Squadron with whom he saw frantic and distinguished service over Dunkirk and then during the dangerous days of The Battle of Britain, when he became an ace. Transferred to the Far East in January 1941 as a flight commander with 243, thence to 453 Squadron RAAF, on 10th December he led a flight of Buffaloes to cover the sinking Prince of Wales and Repulse. 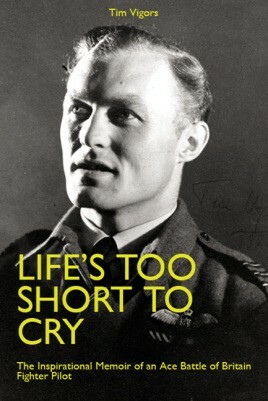 Dramatically shot down, burnt and attacked on his parachute, he was evacuated to Java, and from there to India. And this is where his hand-written account ends. Throughout, the author describes his experiences in an honest, refreshing way. It is a fascinating and valuable record, one destined to be seen as a classic. Postwar, Tim was no less active primarily in the horse world, in Ireland and England, selling, breeding and consulting; but also in aviation, with his own company Vigors Aviation.